Like Turner and Hootch, Tango and Cash, Gary Busey and a bottle of scotch, Mercedes-tuner BRABUS has put together a winning pair for the Geneva Motor Show. 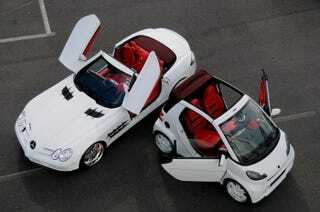 This time it's a Mercedes SLR McLaren and a Smart Fortwo. The SLR McLaren gets a new white carbon fiber bodykit, 20-inch alloy wheels, special interior and an upgrade to the 5.5 Liter supercharged V8 that boots power to 650 hp and helps propel the roadster to a top speed of 211 mph. The matching Smart becomes the ULTIMATE 112, referring to the increase in power to 112 horsepower at 5,600 rpm. The Smart also gets a matching exterior treatment along with the lipstick-red BRABUS Mastik letaher interior and black Alcantara touches. Though sold separately, we think they're a steal when purchased for the package price of $1,062,000. More pics and press release below. An idea from yacht design finds its way into the automotive world: The SLR McLaren roadster BRABUS and its "Tender for the City," the ultimate city sports car BRABUS ULTIMATE 112, both with absolutely identical paint and equipment. BRABUS offers both exclusive speedsters with special snow-white paint for a package price of 699,000 Euros; a very special offer from BRABUS for all owners of an SLR or Maybach. The sportiest drop-top Mercedes of all time, the SLR McLaren Roadster, is fitted by BRABUS with more than just a top-quality white carbon-fiber skin. The exterior is treated to an aerodynamics update, engine tuning and custom-tailored 20-inch wheels further optimize handling and performance, and the interior adds even more touches of exclusivity. To give the SLR even better looks while at the same time reducing lift on the front axle the BRABUS designers have developed a front spoiler that is attached to the stock bumper. This aerodynamics component was optimized in the wind tunnel. It is made from exposed carbon fiber, making it especially light and extremely robust. The rear apron is upgraded with a BRABUS diffuser also made from exposed carbon fiber. It replaces its production counterpart. The sportier appearance of the SLR Roadster is further characterized by the BRABUS Monoblock VI 20-inch Platinum Edition wheels that fill out the wheel arches perfectly. The fully polished three-piece wheels with six double spokes are mounted on the sports car in size 9.5Jx20 in front and in size 11.5Jx20 on the rear axle. Thanks to their high-tech design that features a forged aluminum rim and a billet aluminum center the BRABUS 20-inch wheels are lighter than the 19-inch turbine-design wheels optionally available for the SLR ex factory. High-performance tires in sizes 255/30 ZR 20 and 305/25 ZR 20 are supplied by BRABUS technology partners Pirelli and YOKOMAMA. The tire/wheel combination is custom-tailored for SLR coupe and roadster, and has more than just a visual effect: handling benefits from the switch to even lower aspect ratio tires and the lower rim weight. Thus equipped the drop-top SLR is fit for BRABUS engine tuning. The tuning kit for the 5.5-liter supercharged engine consists of special camshafts and a fuel-cooling system. Power output increases by 24 hp / 18 kW to 650 hp (641 hp SAE net) / 478 kW at 6,500 rpm. BRABUS also offers a special clutch-type limited-slip differential with a locking rate of 40 percent for the SLR. It optimizes traction and thus acceleration performance further: The tuned SLR Roadster rockets from rest to 100 km/h (62 mph) in just 3.6 seconds and reaches a top speed of 337 km/h (211 mph). Exclusive BRABUS cockpit design is characterized by precision handwork down to the last detail. The company-own upholstery shop created a striking combination of lipstick-red leather and black Alcantara. The waffle-pattern stitching of the SLR leather footwells alone - a special BRABUS exclusive - uses some 7,800 meters of the finest red thread. The BRABUS sport steering wheel for the SLR is a sporty and highly functional BRABUS option. The wheel has a flattened bottom for easier entering and exiting and provides optimal grip with its combination of perforated leather and Alcantara. The BRABUS steering wheel features buttons integrated into the spokes for manually shifting the gears of the SLR's automatic transmission without taking the hands off the wheel. Sporty BRABUS carbon-fiber applications for dashboard, center console and door trim transfer the racing look of the BRABUS exterior components into the interior. The interior components are made from exposed carbon-fiber and can be color-coordinated with the leather color upon customer request. The "tender to the SLR" in the white BRABUS fleet is the BRABUS ULTIMATE 112. It represents the ideal complement for city driving. The drop-top two-seater is built based on the latest smart fortwo Cabrio. In addition to its special paint identical to the SLR the ultimate city sports car features a muscular body kit with front spoiler, rocker panels and BRABUS WIDESTAR fender flares front and back. The larger wheel arches provide space for a tire/wheel combination that for this class of cars is highly unusual. The liquid-white BRABUS Monoblock VI double-spoke wheels are mounted on the front axle in size 7Jx18 with size 205/35 R 18 high-performance tires. 8.5Jx18 wheels with size 235/30 R 18 tires on the rear axle provide slip-free traction for the 112 horses under the hood. The height-adjustable BRABUS coil-over suspension is specially calibrated to the ultra-low profile tires and the wider track. It combines direct, safe and sporty handling with excellent ride comfort. With these modifications the ULTIMATE 112 offers the perfect platform for the powerful BRABUS three-cylinder turbo engine. It produces a maximum power output of 112 hp (110 hp SAE net) / 82.4 kW at 5,600 rpm. Even more important for everyday driving is the peak torque of 150 Nm, available on a plateau from 3,330 to 3,900 rpm, an exceptional figure for a car in its class. Shifting in the BRABUS ULTIMATE 112 is done either automatically or the sporty F1 way with shift paddles on the ergonomically shaped BRABUS sport steering wheel. With sprint times from 0 - 60 km/h (38 mph) of 3.9 seconds, 9.5 seconds to 100 km/h (62 mph) and an electronically limited top speed of 170 km/h (106 mph) the snow-white roadster is the ultimate city sports car and thus the optimal "tender to the SLR." The car's performance is accompanied acoustically by the sounds of the BRABUS stainless-steel sport exhaust with its characteristic dual cast aluminum tailpipes. Exquisite highlights also abound in the interior of the ULTIMATE 112: Like its big brother its interior is upholstered in a combination of especially soft and breathable lipstick-red BRABUS Mastik leather and black Alcantara. Embossed BRABUS emblems are part of the exclusive concept as are accents such as speedometer, tach and clock, instrument bezels, dashboard trim, turn signal lever and door handles, all color-coordinated with the exterior color. Stainless-steel foot pedals with rubber pads and an aluminum shifter and emergency brake lever add a bit of racing atmosphere. Climate control system, radio and a navigation system for quick navigating in the city are also part of the two-seater's standard equipment package. Both vehicles in the white BRABUS fleet are available as a package or separately. Customers can freely choose their personal exterior and interior colors.